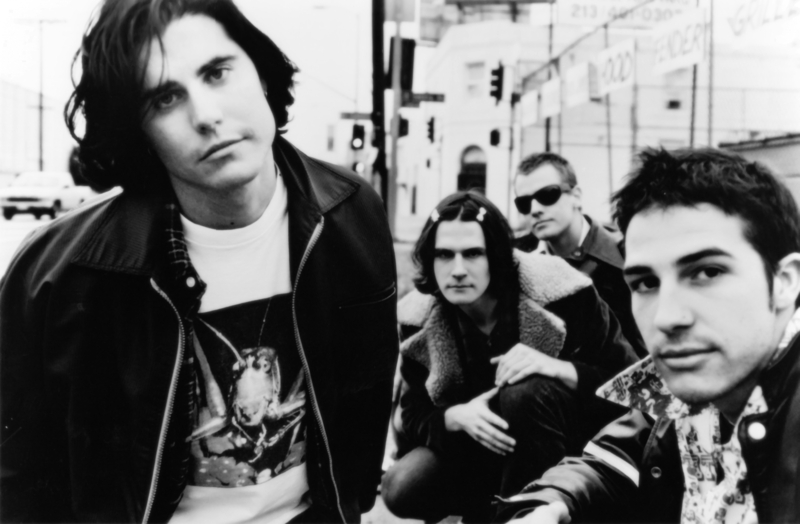 When I was in high school, my favorite band was a little known outfit called The Prayer Chain (see the photo above). I listened to the band’s 1993 album Shawl so obsessively that, in a feverish frenzy to hear something new from the band, I asked my church’s resident audio expert how to play my Shawl cassette backward. Hearing the album backward, after all, would be a way of hearing the album for the first time all over again. Surely, I thought, this will tide me over until the band’s next album comes out. It made a lot more sense when I was sixteen, believe me. It made even more sense when I was diagnosed with Obsessive-Compulsive Disorder in 2004. The audio expert at my church attempted to help me in my hour of need and/or obsession. My copy of Shawl was immediately eaten, but was not irreparably damaged. It turns out cassettes are not designed to be played backward at all. I wrote letters to the Prayer Chain, mailing them to the band’s P. O. Box. To my surprise, bassist and lyricist Eric Campuzano wrote me back. I had asked for one of his bass guitar picks, and one of guitarist Andrew D. Prickett’s picks as well. Ever the completist, I had also asked about the availability of the band’s independent album, Neverland Sessions. Campuzano not only wrote me a letter, but mailed me the requested guitar picks and a copy of Neverland Sessions, free of charge. It was the highlight of my sixteenth year—even better than getting my driver’s license. But there is a rather humorous story here as well, and I feel compelled to tell it—I will explain why later. After the band’s Mercury record was released on Rode Dog Records in 1995, I reviewed it for Essential Connection magazine and mailed a copy of my review to the band, hoping the band would correspond with me again. 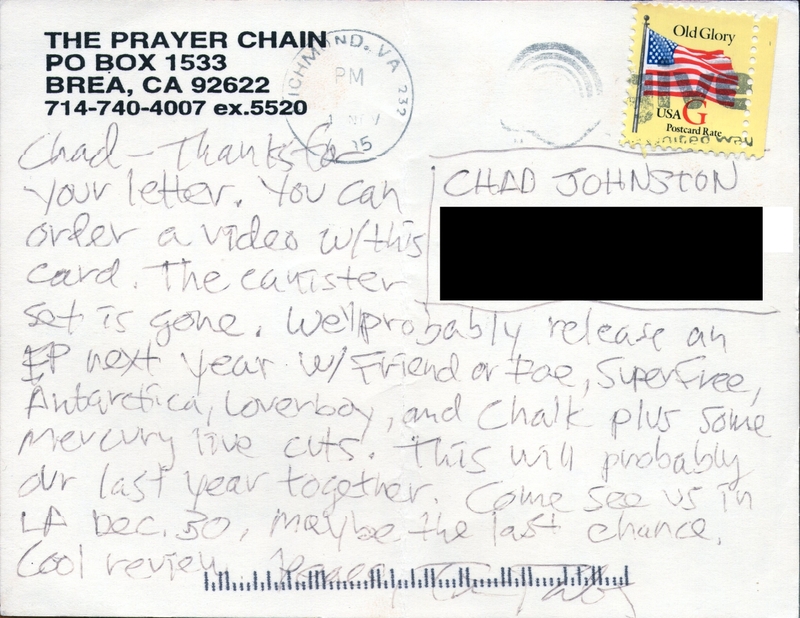 I received the postcard below from Tim Taber, the band’s frontman. Taber, as any Prayer Chain fan worth his salt (his Salton Sea salt, I might add) would know, was more or less publicly blamed for the band’s demise. He was reportedly dissatisfied with the musical direction of the band after Shawl. That Taber was on a different page than his bandmates was manifest even in his correspondence with me. In the postcard above, Taber tells me I can order “a video with this card,” and also informs me—much to my dismay—that the band is headed for Splitsville, where all bands retire. 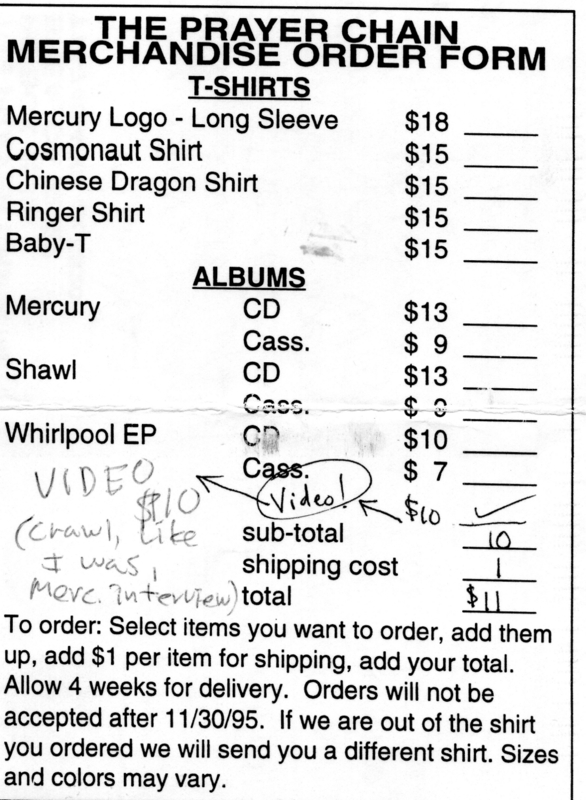 The flipside of the postcard, as seen below, is a merchandise order form for the band. I mailed my merchandise order to the band, writing and circling “Video!” and pointing to Taber’s addition to the order form with multiple arrows. A few weeks later, I received a package from the band that was far too slender to contain a VHS cassette. The package contained another letter from Campuzano, and the postcard from Taber. As it turns out, Taber had offered me—rabid, foaming-at-the-mouth fan I was—a video that was no longer available for purchase. I still have not seen that video. Taber was on a different page than the rest of the members of the Prayer Chain, and not merely where music was concerned. He was even on a different page where the availability of the band’s merchandise was concerned. I say this not to demonize him, because I like Tim Taber. He was the lead singer of my favorite band. I say this because stories like this need to be told in order for mythmaking to occur. More on this below. Back to Campuzano’s letter first. Campuzano’s letter is a gesture of grace, smoothing over Taber’s error, and making up for the misinformation he provided. I know some Prayer Chain fans harbored ill will toward Taber after the band’s demise, but I did not. I was amazed that he had mailed me a handwritten postcard in the first place. Eric’s letter was the icing on Taber’s postcard’s cake. As much as that can possibly make sense. I wanted to tell this story because so few of the acts from the Christian alternative underground of the ’90s are written about anywhere. While the Prayer Chain remains obscure, the band’s secular contemporaries have seen their albums celebrated, expanded, and reissued in recent years. I wanted to engage in some musical myth-making because no one else seems to be doing it, and I cannot help but think that someone should be doing it. Somebody should be saying things like this. For some bands, the mythology surrounding the band almost eclipses the music. Consider this my attempt at musical mythmaking. I want the Prayer Chain’s name to live on, and not just in iPods. I want it to live on in the imaginations of Prayer Chain fans everywhere. For the record, The Prayer Chain was able to have the last laugh where Mercury was concerned. Last year, the band set up a Bandcamp page and offered the world Humb—the album the band intended Mercury to be before the suits at Reunion Records pulled a Yankee Hotel Foxtrot and rejected it. I will be posting a companion post for this entry, so Prayer Chain fans: Keep a watchful eye.